Today we're eating sushi rolls! One of my favorite favorite things to eat in the whole wide world! 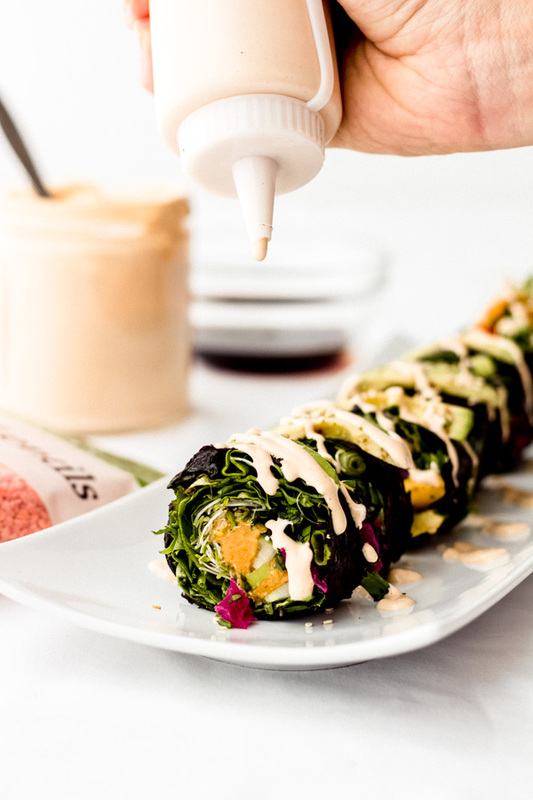 Of course, our sushi rolls are plant-based, so we're stuffing them with a bunch of fresh veggies and nutritious pulses! If you read my previous post, the kidney bean chickpea pasta salad, or if you follow me on social media, you might have heard that I've teamed up with USA Pulses and Pulse Canada to promote and spread awareness of what pulses are. Surprisingly not a lot of people have heard of the term, yet, I guarantee you have consumed them before. See? You've been eating pulses all this time without even knowing it. Consuming pulses has a ton of benefits. For one, pulses are super nutritious. They are a great form of protein and fiber - and if you are plant-based like I am, this is super beneficial to have added to your diet. 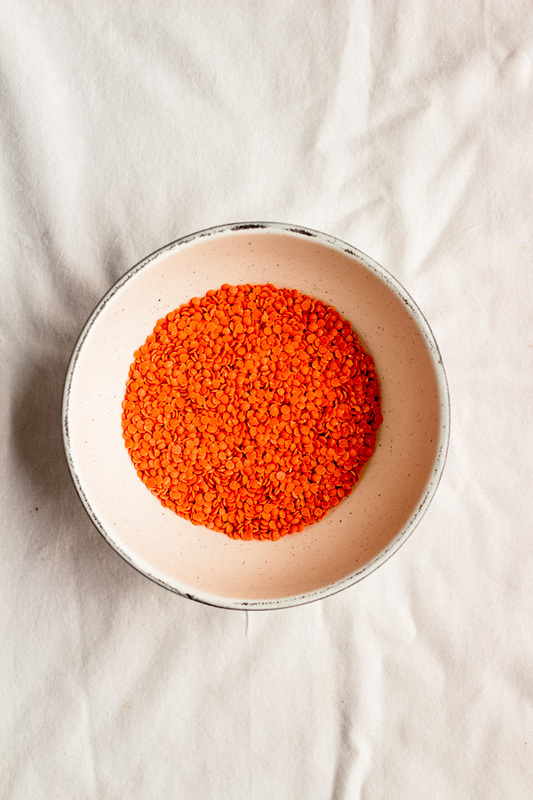 Pulses are also a sustainable crop, which is good for the environment. And they are affordable and super versatile. There are so many variety of pulses (you can see a ton of different ones here) that you won't get bored of eating pulses for a long time. Ever since learning about pulses I've committed to the 'half-cup habit'... which is basically a campaign to get people to eat half a cup of pulses (lentils, chickpeas, dry peas, beans of your choice!) just three times a week! Even the USDA has stated that consuming this amount of pulses a week can benefit your health, so lately whenever I create a recipe I am trying to incorporate pulses and making sure it includes at least half a cup! If you are looking for a way to enjoy healthier foods, then the half cup habit is an easy and convenient way to start that journey. And you can even sign up for free on their website to receive the recipes directly to your inbox along with easy meal prepping tips, a digital cook book, and a few other freebies. You can learn more about this via this link. So, back to the sushi. 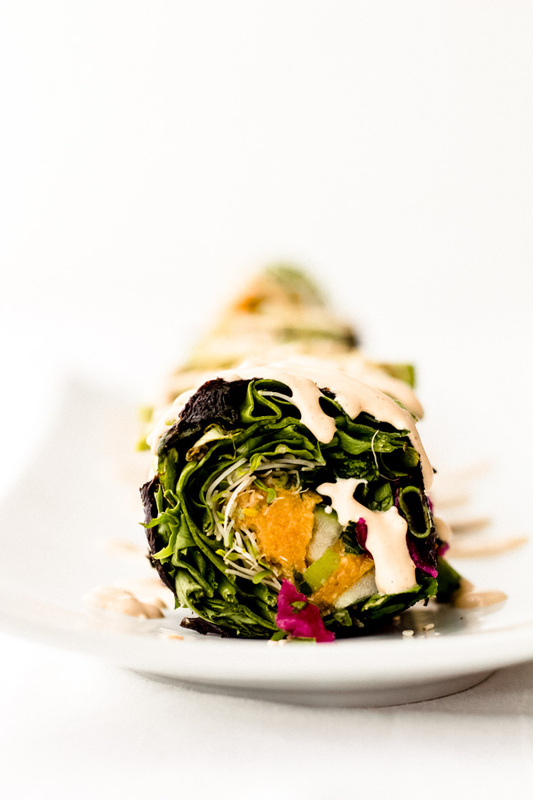 Enter - smoky red lentil rainbow nori roll! 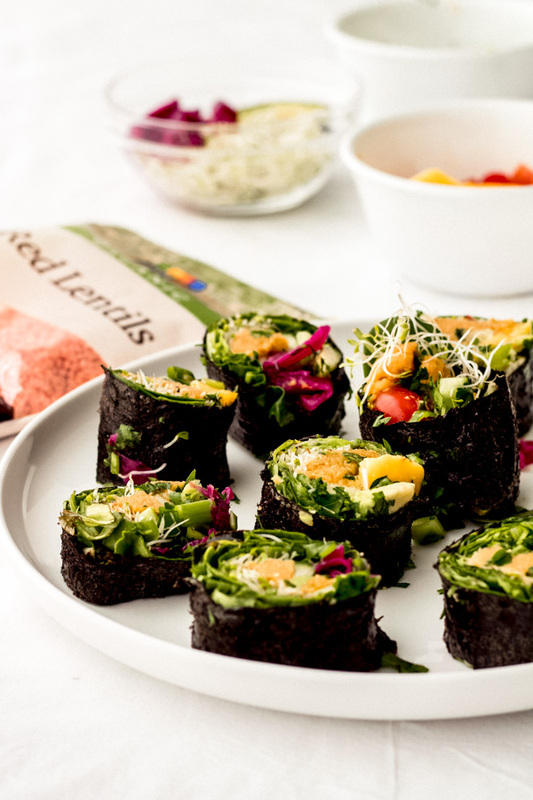 This smoky red lentil rainbow nori roll contains half a cup of pulses per serving, obviously, and tastes delicious. I love the combination of the smoky red lentils with the fresh veggies. I also added mango slices because I'm a huge fan of sweet and savory foods combined - I think it helps balance out the salty flavor of the lentils. But if you are not a fan of that combo, feel free to leave it out. 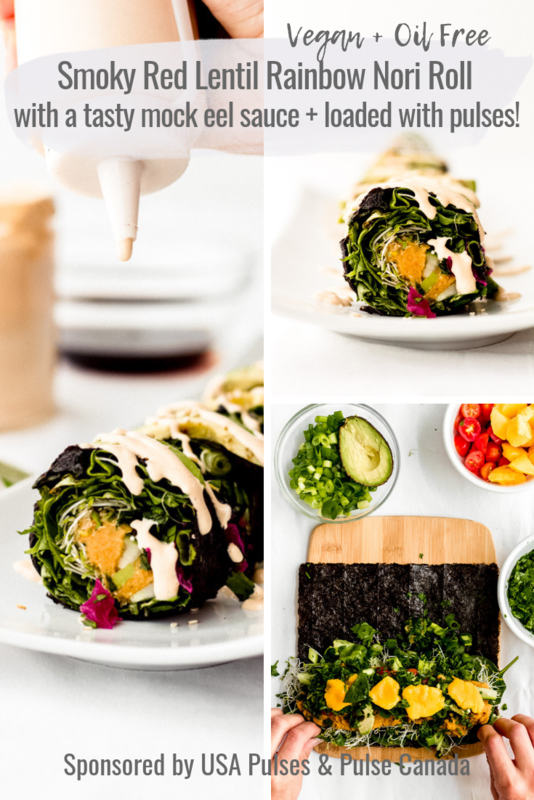 Veggie nori rolls are so versatile because really, you can add or remove whatever veggies you want. If you don't have a specific veggie, leave it out or swap it out for something you do have in the fridge at the moment. Anyway, hope you guys enjoy this smoky red lentil nori roll friends! 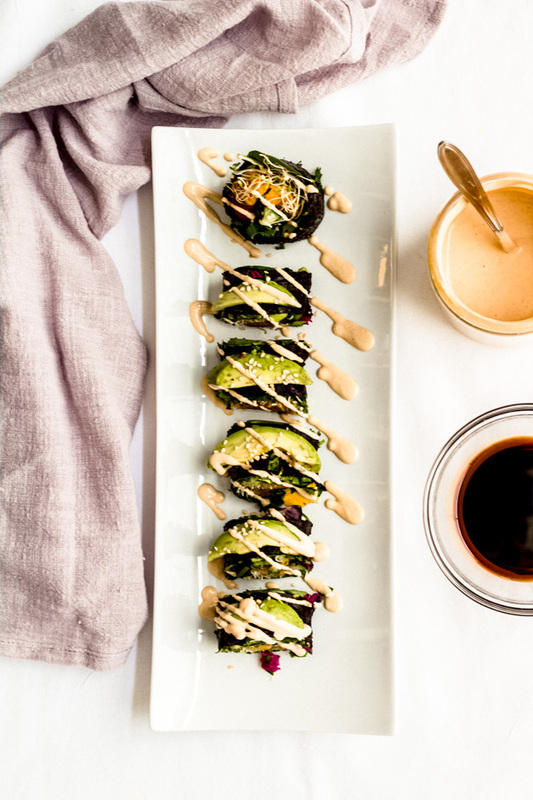 Delicious smoky red lentil rainbow nori roll stuffed with fresh veggies topped with a tasty mock eel sauce. Prepare the smoky red lentils. Bring 2 cups of veg broth and 2 cups of water to a boil (takes about 3 to 5 minutes), lower the heat, add lentils and gently stir. Continue to cook lentils in a gentle simmer on low/medium heat with a lid slightly tilted. Add spices and stir to combine. Continue to cook until most of the water has evaporated and the lentils are thick (should not be runny). Set aside. Prepare the fillings. Chop and slice all veggies as needed. Set aside. Prepare the mock eel sauce by adding tamari sauce and agave in a small bowl and mixing to combine. Once lentils are ready and have cooled down a bit, let’s stuff the roll! 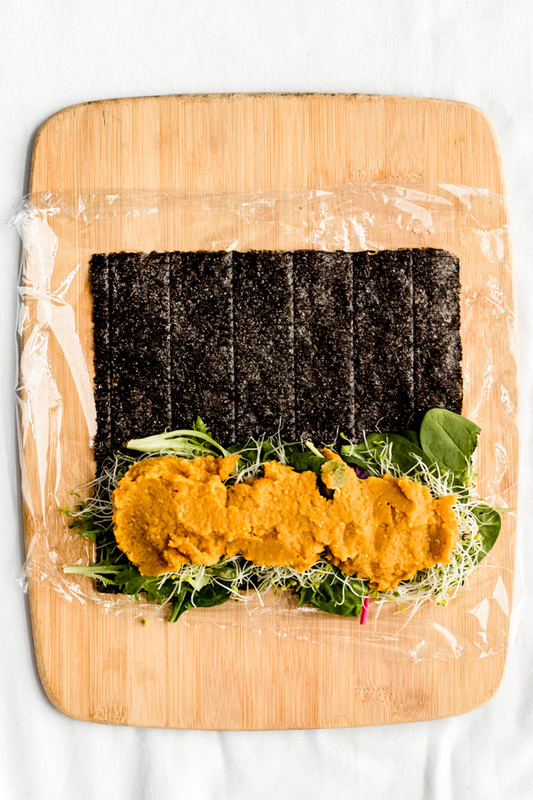 Place a nori sheet on top of a sushi mat (you can also use a piece of parchment paper if you don’t have a rolling mat).. and begin layering your roll preferably in the following order: mixed greens (use about one cup), sprouts, 1/2 cup of red lentils (per roll) and then you can begin adding the rest of the veggies: tomatoes, avocados, green onions, cucumbers, fresh parsley, and optional mangoes and sauerkraut. 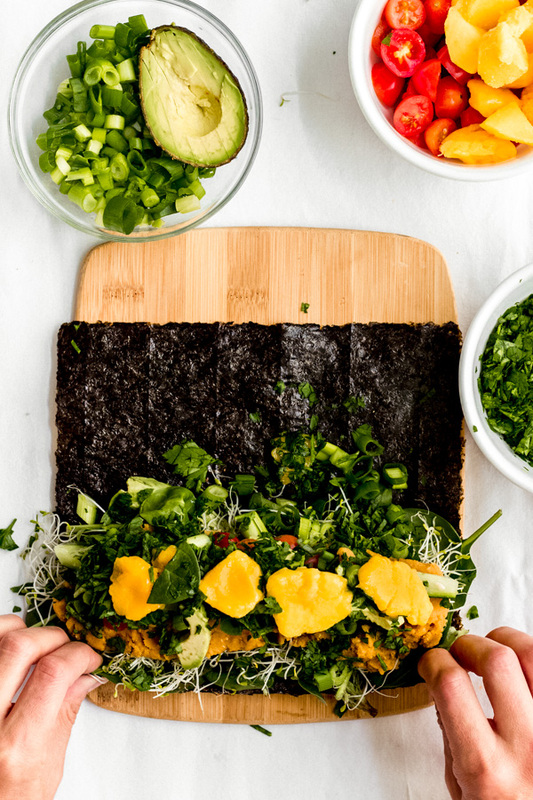 Note: Make sure to stack everything on top of each other (as pictured) and not spread across the nori sheet or else it’s going to be very difficult to roll. Let’s get ready to roll! Using the mat for support, lift the nori sheet edge closest to you up and over the filling. Use the mat to compress and mold the roll even further. Continue rolling until you’ve rolled all the way. Using a really sharp knife slice the roll. Continue until all fillings have been used up – should make 4 sushi rolls. Serve immediately with mock eel sauce and/or chipotle mayo. 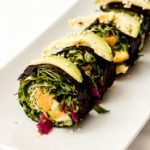 Mangoes are optional but I find it super tasty with this red lentil roll because it adds a delicious sweet flavor which balances out the salty/savory ingredients. If you’re not a fan of sweet and savory together, then maybe leave out mangoes. This recipe makes 4 servings with 1/2 cup of pulses in each serving.